suitable for travellers looking for a familiar, genuine and warm atmosphere, away from crowds and urban life. 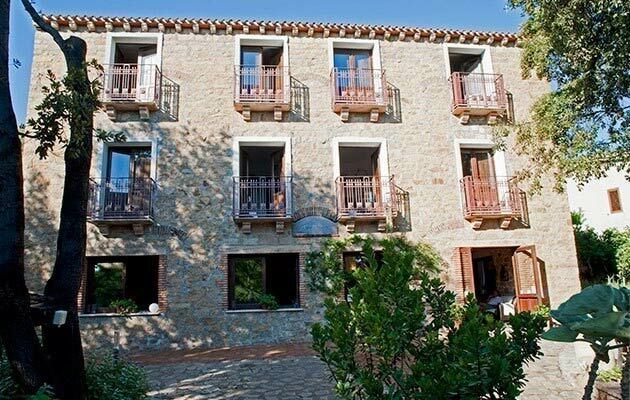 The Hotel Nascar is located in the historical center of Santa Maria Navarrese, a small fishing village in the Ogliastra. 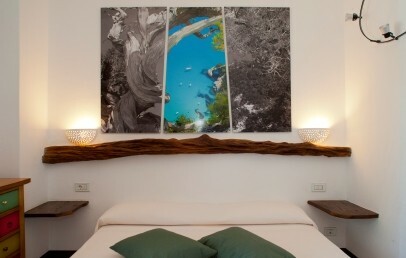 At 50 m from the sea and 150 m from the marina, in a garden of oaks and close to a thousand years old olive trees, the hotel has the advantage of being in town but not far from several points of interest. The nearest airport is Cagliari, 138 km away, while that of Olbia is at 191 km. The name of this small but charming Hotel Nascar has a historical background. The story says that around the year 1000, the Church of Navarre, as it is named now, had the name of Temple of NASCAR. In the year 1052, a daughter of the King of Navarre arrived in this part of the coast and, having overcome terrible weather conditions during the crossing, she decided to make a vow and build a church in honour of Saint Mary. In addition to this historical origin, the name of this hotel may have been suggested by a delicate yellow flower common in the Mediterranean area. 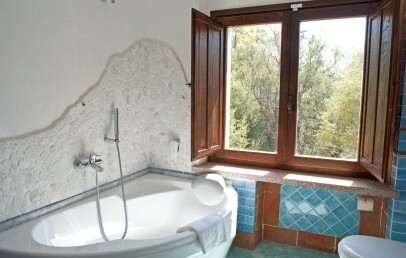 The Hotel Nascar is the result of a careful renovation of an old structure built in local granite during the year 1800. The building was originally used as a granary before being used for the production of wine. Even if the original architecture has been preserved, the hotel appears now to be warm and welcoming featuring a modern Sardinian style. In addition to these structural details, we should note that the professionalism and kindness of the owners and their employees will considerably contribute to make of the simple accommodation a luxury place with details worth of an exclusive hotel. Moreover the hotel is proud to have been rewarded with the European ECOLABEL referring to the environment safeguarding. The 12 rooms of the Hotel Nascar are modern and very good equipped. All of them feature unique details that differentiate one from the other. The accommodations are simple and the dominant color is white and all are furnished with attention to detail, making the rooms cozy. 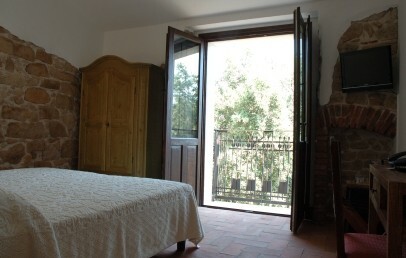 They have been furnished with wooden pieces of furniture but also wrought iron, nice and colorful ceramics and embellished by handmade Sardinian fabrics and unique juniper wood details. They are all equipped with modern comforts: minibar, air conditioning, TV with satellite channels with LCD screen, hairdryer, shower or bathtub. All rooms with the small balconies are located on the front side of the hotel. Available a room equipped for guests with a disability. The catering service strikes already starting with breakfast, which abounds with local products, jams and fresh bread. The Hotel Nascar also offers a restaurant service with high level cuisine with high quality ingredients and regional recipes. Guests cannot miss the dishes based on fresh fish caught in the area. All this is accompanied by a smile and excellent professional staff. The Hotel Nascar has the advantage of being not too far from the hiking trail called “Selvaggio Blu” (Wild Blue), surely one of the most picturesque in Europe. This could be a good starting point for adventures that have to do with the sea or the mountain such as: climbing, quad, off-road, caving, horseback riding camp and various water activities. At clients’ disposal are some normal and electric bicycles (a small maintenance fee required). Parking area; newspapers; beach service included from June 1st to September 30th with sun umbrellas, sun beds and towels, the beach can be reached on foot; baby sitter on request, beauty treatments (manicure, pedicure, evening makeup, etc.) and massage, hairdresser, room service for breakfast. Excellent night bar in open air with good music and cosy atmosphere. 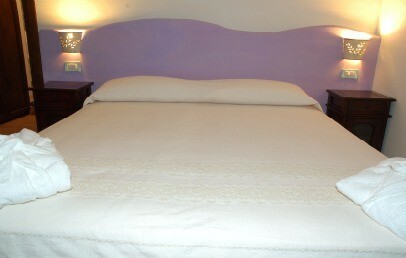 Simple and comfortable double rooms with a four-poster bed located either on the first or on the second floor. 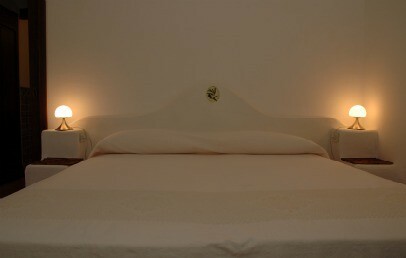 They are well-lighted and can accommodate up to 4 persons. They are characterized by the color white and fully realized with local materials. Both Junior Suites are decorated with juniper wooden, wrought iron, colorful ceramics and embellished by handmade Sardinian crafts. The bathroom has a bathtub. 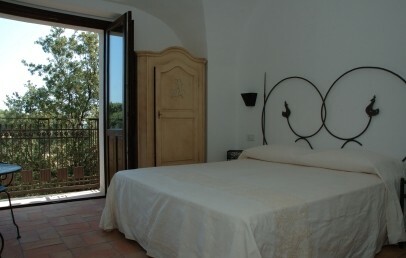 The Junior Suites have a balcony, the one on the first floor overlooks the nice garden while the other on the second floor, overlooks the sea. 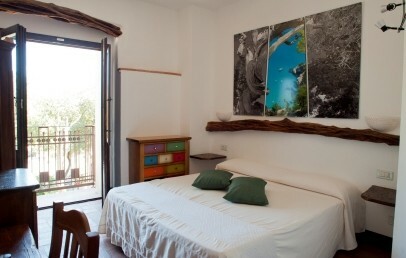 A simple and comfortable double room located on the first floor. The Executive Deluxe room is well-lighted and characterized by white color and fully realized with local materials. 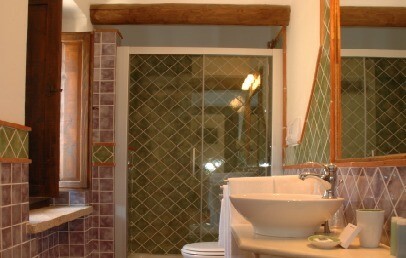 All rooms are decorated with juniper wooden, wrought iron, colorful ceramics and embellished by handmade Sardinian crafts. The bathroom has a shower. 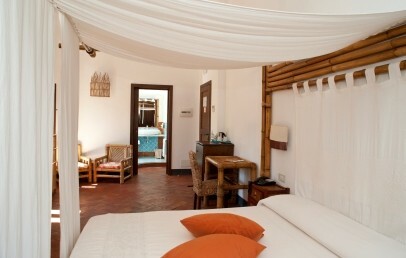 The Executive Deluxe room has a large terrace of approx. 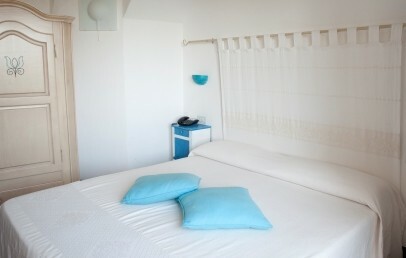 50 sqm equipped with sofa, table and loungers and with view on the back side of the hotel. 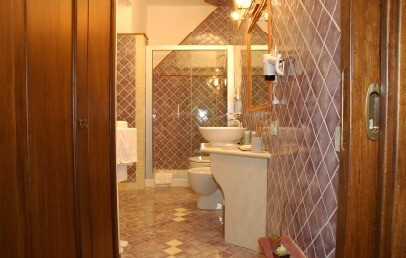 It is possible to accommodate up to 3 persons, on request. 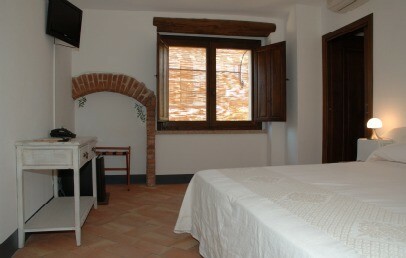 A double room Standard located on the second floor. 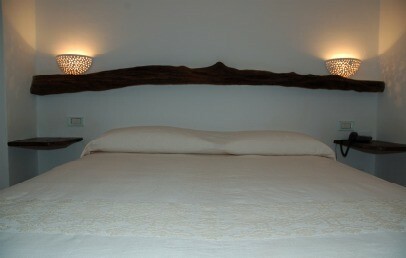 They are furnished simple and comfortable, characterized by white colour and fully realized with local materials. 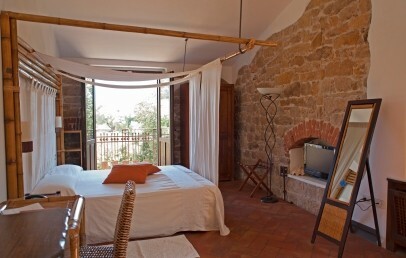 The rooms are decorated with juniper wooden, wrought iron, colorful ceramics and embellished by handmade Sardinian crafts. The bathroom has a shower. 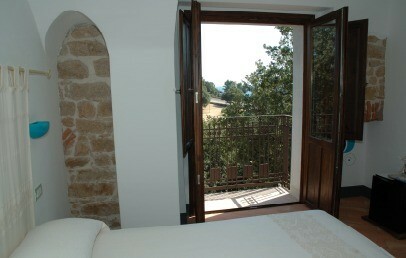 The Standard rooms have all a window with view on the back of the hotel and can accommodate up to 3 persons. Double rooms located on the second floor. They are furnished simple and comfortable, characterized by the color white and fully realized with local material. 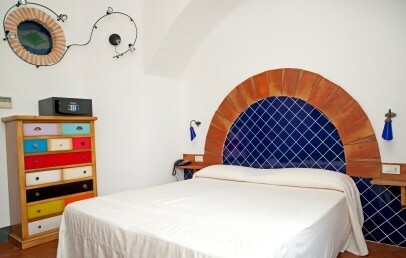 The rooms are decorated with juniper wooden, wrought iron, colorful ceramics and embellished by handmade Sardinian crafts. The bathroom has a shower. A small balcony offers partial sea view. Double rooms located on the first floor. They are furnished simple and comfortable, characterized by the color white and fully realized with local material. 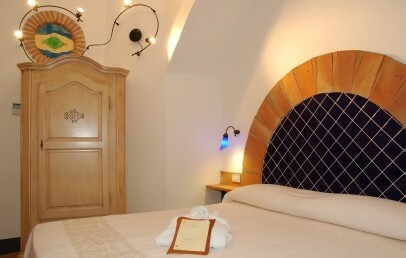 The rooms are decorated with juniper wooden, wrought iron, colorful ceramics and embellished by handmade Sardinian crafts. 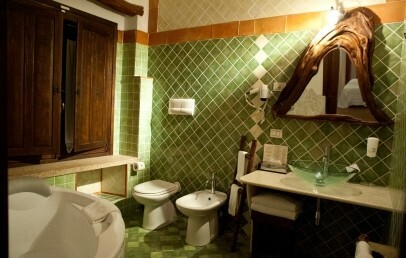 The bathroom has a shower and one room has the bathroom equipped for guests with a disability. 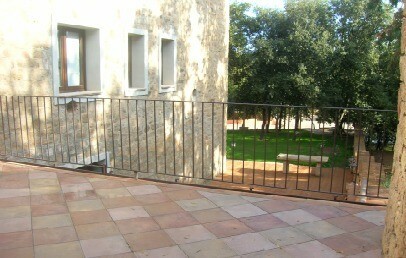 A small balcony overlooks the nice garden. Long Stay - Book at least 7 nights and the last one is free of charge! Long Stay - Book at least 14 nights and last 2 nights are free of charge!